Today is Memorial Day, a federal holiday observed on the last Monday of May. Formerly known as Decoration Day, it honors those who have died in military service. While many visit cemeteries during Memorial Day weekend, it now is better known for sales and as the traditional start of summer. Given the traditional theme for the holiday, why not use this as a conversation starter on a topic that many tend to avoid–end of life planning. Legal & financial: Organize your financial house. What happens to your physical assets? If you have young children, who will take care of them? 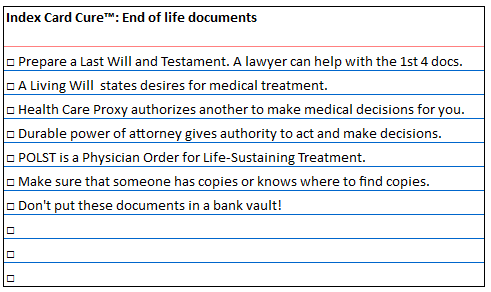 A Last Will and Testament helps manage your estate and distribute your property after death. It also identifies who is responsible for minor children. A lawyer can help with this document. Just make sure that your NOK (next of kin) can find a copy of the will or the state will determine what happens. A Durable power of attorney (DPA) gives authority to your designee to act and/or make decisions, even after you die or become incapacitated. Body: Decide on what’s important to you regarding care of your body. While you can’t anticipate all the healthcare decisions that might arise, there are forms that guide the process. A Living Will and Health Care Proxy or Surrogate are usually two separate documents and differ by state. The living will identifies treatments you want and don’t want. The proxy/surrogate form identifies who will make the decisions if you are ill and unable to handle decisions yourself. For the proxy, choose a person who understands your desires for treatment instead of imposing their own values on decisions. Project Grace http://www.projectgrace.org/Advance-Directives has more information, copies of documents for download and information on the requirements of each state. After death ceremonies are for the living. What will happen to your body? Various options for body disposition differ significantly in cost. The average body burial funeral costs between $7,000 and $10,000. Planning in advance will protect family members from adding significant debt to their grief. Do you want a funeral or memorial service; religious or secular? When you are dead, you can’t communicate your desires, so let your loved ones know. If you or your loved one was a veteran of the armed forces, investigate what may be benefits available http://www.cem.va.gov/burial_benefits/. May 26, 2014 in Body, Relationships, Spirit.